Historian Douglas Wilson lecture's explored the Bard’s influence on the Illinois rail splitter and was the third in our series of three Lincoln lectures commemorating the 150th anniversary of The Emancipation Proclamation. Wilson, a professor emeritus at Knox College in Illinois, is co-director of the Lincoln Studies Center and has authored or edited several works on Lincoln. Abraham Lincoln's love of Shakespeare was well known to his friends and associates and has been acknowledged by scholars. However, such studies do not shed much light on either Lincoln or his era. Rather, they have consisted mainly of attempts to identify relevant sources —such as references to Shakespeare in Lincoln's writing or conversation — and speculations about the effects of Shakespeare on Lincoln's language and thought. Wilson’s approach has been quite different—he considers which texts Lincoln might have been familiar with and explores Shakespeare's standing in America in the antebellum period. The President and co-founder of Zelnick Media, he was previously CEO and President of three major entertainment companies, including BMG Entertainment, Crystal Dynamics, and 20th Century Fox. He is the author of Success: A Concise Guide to Having the Life You Want (2011). While business school and law school have been instrumental to his career, Zelnick double-majored in English and Psychology, and attributes much of his success in life to his grounding in the humanities. "In my view," he says, "the most important driver of success is knowing what you want. When I talk to people about their careers, I often pose the question: "What factor is most highly correlated with success?" The answers I generally hear include: intelligence, education, competence, ambition, perseverance, talent, passion and luck...In my case, I'm often asked how my own professional success came about...Over the years, as my career and interests have evolved, I've taken the time to change my goals accordingly, as well as to include personal ones. Knowing what I want and focusing on it has helped me largely to achieve it...The most important thing you can do to achieve the success you desire is to discover your ambition, narrow its scope with as great a degree of specificity as possible, emblazon it on your consciousness and revisit it daily. On Monday, November 19th, at New York University’s Center for the Study of Transformative Lives, historian Eric Foner delivered a public lecture on Lincoln’s transformations regarding slavery and race entitled, “Abraham Lincoln and the End of American Slavery.” This lecture was the second in our series of three Lincoln lectures commemorating the 150th anniversary of The Emancipation Proclamation. Eric Foner is the DeWitt Clinton Professor of History at Columbia University. 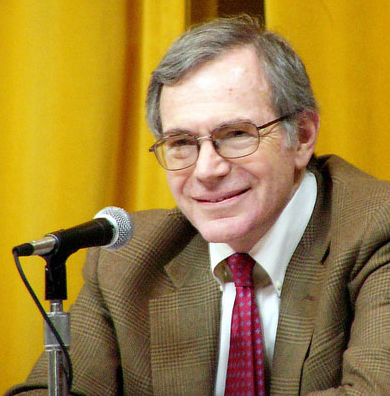 In his teaching and scholarship, Foner focuses on the Civil War and Reconstruction, slavery, and 19th century America. His book Reconstruction: America's Unfinished Revolution, 1863-1877 won the Bancroft, Parkman, and Los Angeles Times Book prizes. It remains the standard history text of the period. In 2011, his work The Fiery Trial: Abraham Lincoln and American Slavery was awarded the Pulitzer Prize for History as well as the Bancroft and the Lincoln prizes. On the anniversary of the Gettysburg Address, Foner’s lecture examined the fascinating and contested relationship between individual and social agency in bringing about societal transformation. He discussed how Lincoln came to emancipation during the Civil War, the various pressures on him -- military and political as well as from slaves themselves -- and how emancipation changed the nature of the Civil War as well as Lincoln's own outlook on the place of African-Americans in American society. The free event was sponsored by the Center for the Study of Transformative Lives and the university’s Biography Seminar. At a time when public interest in Lincoln underwent a surge brought on by increased media attention, this lecture offered new and contrasting insights into this turbulent period of social transformation. On Thursday, September 27 at New York University’s Center for the Study of Transformative Lives, historian James Oakes delivered a public lecture on history and significance of The Emancipation Proclamation entitled, “The Emancipation Proclamation: Myths and Realities.” Oakes, a professor at the Graduate Center of the City University of New York, is a winner of the Lincoln Prize for his book, The Radical and the Republican: Frederick Douglass, Abraham Lincoln, and the Triumph of Antislavery Politics. This lecture was the first in our series of three Lincoln lectures commemorating the 150th anniversary of The Emancipation Proclamation. The lecture coincided with the 100th anniversary of the Preliminary Emancipation Proclamation of 1862, through which President Abraham Lincoln stated his intention to free all persons held as slaves within the rebellious states. One hundred days later, he issued the final Emancipation Proclamation. “Even before it was issued, the Emancipation Proclamation was shrouded in mythology,” Oakes observes. “Critics were already speculating about why it was taking Lincoln so long to issue it, some arguing he was a reluctant emancipator and others that he was a brilliant statesman who bided his time until the American people were ready for emancipation. Skeptics were dismissing the impending proclamation as an empty gesture that would not free a single slave, and others predicting it would free every slave in America.” Oakes notes that by the time it was issued, the arguments over the Proclamation had hardened into myths that have endured for 150 years, adding, “To this day, we still can’t answer the simple question: ‘What did the Emancipation Proclamation actually do?’ ” This free event, which was sponsored by the Center for the Study of Transformative Lives and the university’s Biography Seminar invited NYU professors and students, as well as members of the wider public to join in the lively discussion over one of the most significant moment’s in this nation’s history.